When it comes to hauntings, you can't get much creepier than land cursed by Native Americans. There's a reason it's a common theme in horror films. Developer buys land, learns that there's an Indian burial ground there, builds anyway, dies a horrible death. But that's all just cliche Hollywood scares, right? Maybe not, at least when it comes to the terrifying tale of Arizona's Apache Death Cave. On a small patch of land near Canyon Diablo, just off Interstate 40, lies the ghost town known as Two Guns. Though there are still crumbling reminders of the town's use a 20th century tourist attraction, it's been abandoned for well over half a century... though the region's Native American tribes have been avoiding the area for a lot longer than that. According to their legends, the dead cursed the land, and anyone who dared reside there was risking the anger of spirits who met a terrible fate. Naturally, white dudes didn't listen, leading to some eerily-predicable ends worthy of their own horror films. But more on that in a bit. The angry spirits, hell-bent on revenge, are thought to be a lost band of Apaches, who in 1878 conducted a bloody raid in which they murdered every man, woman, and child in a Navajo camp (save for three girls kidnapped for, well, nefarious reasons), before ransacking the village. As soon as the Navajo leaders caught wind of the massacre, they organized their revenge, sending two dozen of their best warriors out to track the Apache through the desert. Soon, news arrived that there had been another raid, and a small search party was deployed near Canyon Diablo. Just when they were about to give up on their quest, they stumbled upon a bizarre anomaly in the desert. A blast of intensely hot air suddenly shot through the ground, startling the men and their horses. As the trackers took a closer look, they discovered that the Apaches had actually taken shelter in a huge underground cave, large enough to hold 42 men and their horses. The heat from their fires had risen through the ground, giving away their position. The scouts quickly returned to their party where they devised a plan to exact quick and terrible revenge. After silently taking out the Apache nightwatchmen, the Navajo warriors gathered up as much dry brush and canyon driftwood as they could carry. They quietly piled the materials at the entrance of the cave hideout and set it alight. It wasn't long before smoke began to billow through the cave, choking the Apaches who had been hiding. After using what was left of their water reserves in an attempt to put out the approaching blaze, the Apache raiders made a gruesome last ditch effort to snuff the fire - they slit the throats of their horses, saving what little oxygem that remained for themselves and using the animals' blood to douse the flames. It was no use. they were trapped, and they knew it. The legend says that a lone Apache managed to break through the brush, only to be quickly captured by the Navajos. The man begged and pleaded for mercy, offering to give back all they had stolen, and more, in exchange for the lives of he and his men. It was a deal that the Navajos were prepared to accept, at least until one of the men asked what happened to the three kidnapped girls. The answer so enraged the revenge party that they threw the man back into the fire and added more fuel. When the smoke and the screams had finally subsided, the Navajo party cleared away the ashes and were met with a gruesome scene. A wall of charred horses were piled high, a makeshift barrier between the trapped men and the flames. 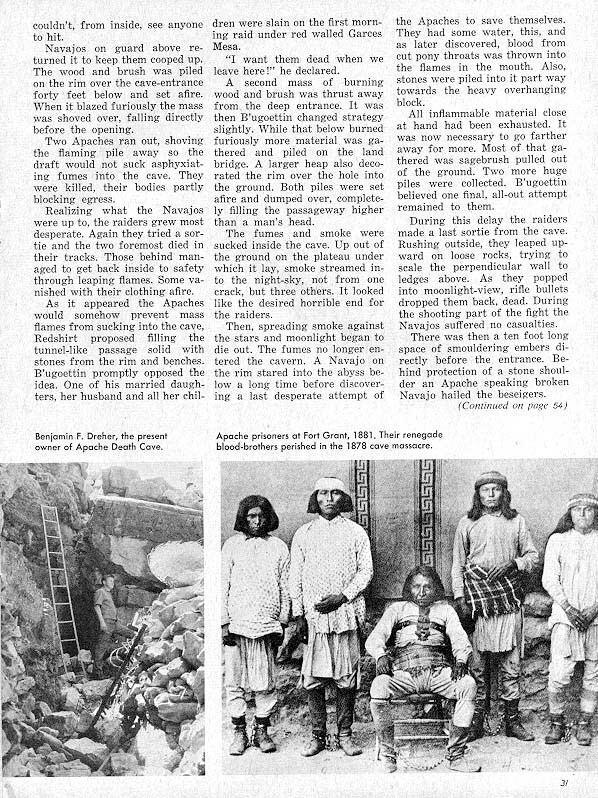 Behind the wall of burnt meat lied the bodies of the Apache men, 42 in all, who had suffocated inside the cave. From then on, neither the Navajo or the Apache people dared to go near the cave again, and there was never another raid. They believed that the horrific way in which the raiding party died had cursed the land. The Native Americans shared this belief with the pioneers who came to the area, warning them to stay away from the cursed locale. Naturally, the white dudes did the exact opposite.... they built an entire town on top of the cave. After pioneers established Two Guns, it wasn't long before residents began to complain about ghostly activity. The sounds of tortured moans would emenate from the cave below, disembodied footprints could be heard circling the buildings, and a general feeling of unease permeated the entire town. People started believing the curse, and the more fearful in the community fled, never to return. Many residents who stayed saw their buildings destroyed by mysterious fires, or were just plain murdered, their killers never brought to justice. As the town slowly withered away, one man had the brilliant idea to turn the Apache Death Cave into a tourist attraction, actually using the bones of the dead Apache warriors as props for his roadside display. 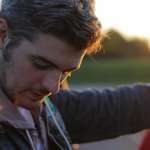 He was quickly mauled by wild animals on two seperate occasions and run out of town by an angry mob. Even stranger, the section of old Route 66 that passed Two Guns was known to be a particularly dangerous stretch of road responsible for more car accidents than reasonable. Today, the town of Two Guns is completely empty, and probably for good reason. Its buildings sit crumbling in the hot sun, its roads cracked and thick with weeds. The Apache Death Cave still lies beneath the town, faded black scorches still thick on the walls. Adventurous travelers, who decide to stop in Two Guns, can still easily access the cave, but locals will warn you against it. They say that visitors who dare approach the cave entrance at night are quickly scared off by the moans of the angry spirits, and those unwise enough to venture inside are, to put it crudely, playing with fire, risking sickness, bad luck, even death. But hey, that's all just horror movie nonsense. Right? America's Creepiest Abandoned Amusement Park is Open for One Month Only! Russell Crowe bought this place back in 2011 and planned to remake west world but it didn't come to fruition. It's a really eerie place to visit. Love to see this place.